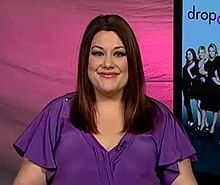 Brooke Elliott (born November 16, 1974) is an American actress and singer. She has appeared in musical theatre, including the US tours of Beauty and the Beast and Wicked, and the Broadway productions of Taboo and The Pirate Queen. She is best known for her role as Jane Bingum on the Lifetime series Drop Dead Diva. I'm supportive of anyone, male or female, feeling good about themselves. I'd love to go back to Broadway if there was a place for me there. I would absolutely go back; it's just a part of me. I support anyone finding their worth despite being told they can't do something. I believe that all things are possible under God. I think a lot of times we're so told in our world that marriage is everything, and having a partner is everything. If you look at our movies and things, it's all directed around that love, and if you don't have that love, how sad you are. Sometimes someone that is the 'villain' in your life, when you look deeper and you think of what their issues are and why they behave like that and where they came from - they become less of a villain and more of someone that you can understand. I haven't seen one second of any episode of 'Lost,' ever. In 'Robin Hood,' I did quarterstaff fighting. I try to get massages on Saturday. That's my only day off. Ty Burrell could be one of the funniest people on the planet. I'd love to meet him. I'm still a big 'Grey's Anatomy' fan. I'd love to go back to Broadway; I'd love to do animation; I'd love to do hair and make-up campaigns because I love hair and makeup - and, I'd love to do film. I mean, there are a lot of doors I'd love to open up! I started off singing when I was little. My parents have said I was singing at 3 years old. So I think it was just something I probably came into this world wanting to do and knowing I was going to do.